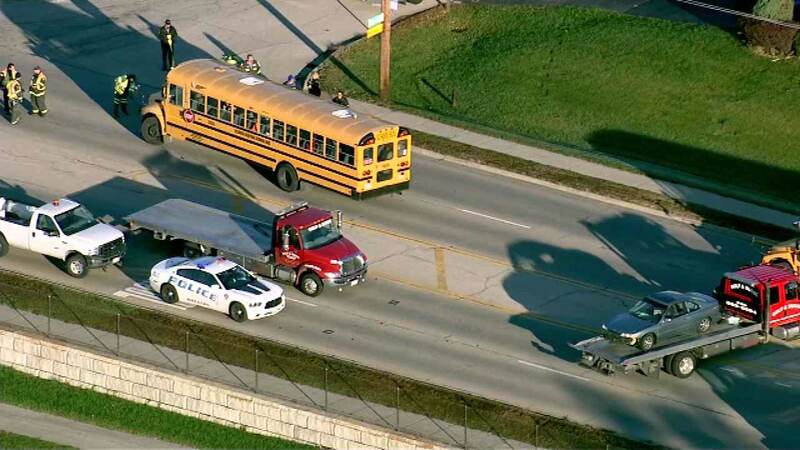 WHEATON, Ill. (WLS) -- Police say 13 people received non-life threatening injuries in a crash involving two vehicles and a school bus in Wheaton. A Honda Accord was turning left onto Geneva from Purnell around 7:46 a.m. Friday when it allegedly struck an air compressor being pulled by a van traveling eastbound on Geneva, police said. The Honda then spun out of control, and a school bus traveling westbound on Geneva allegedly struck the passenger side of the Honda, police said. The school bus was carrying about 50 students at the time of the accident. Twelve students and the driver of the Honda were transported to local hospitals with minor injuries.